If you want to add an existing file to a project and have the project point to the file where it resides, press the little arrow key on the right side of the add button on the add existing dialog. The arrow will present a small context menu that allows the option of adding the file as a link, which will cause the Visual Studio project to point to that file where it is instead of copying it to the project directory. Normally when you use “ctrl + f” and search for results, you have to navigate one by one in every file where the searched string exists. 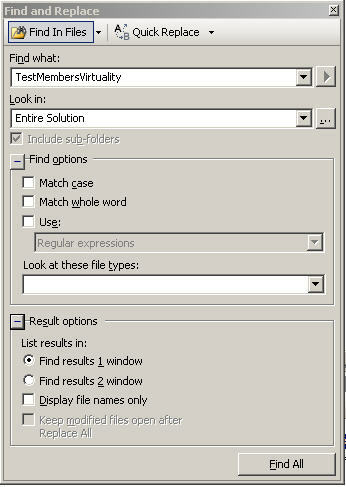 There is an alternative to this rather than navigating one by one you can have all the results in your “find window”. you can click on the search result line to navigate to that part. This is extremely helpful when you want all your results to be listed in a find window rather then to navigate one by one in every file where the searched string exists.